Join Kingston University alumna and world record holder, Fiona Quinn, as she explores how you can evaluate and take risks to achieve success on your own terms. Whether you want to reduce the impact of work on your personal life or radically rethink your career, Fiona will share her experiences from her World Record breaking adventure and her entrepreneurial journeys. Fiona (European Real Estate, MA, 2009), is an adventurer, speaker and entrepreneur. In 2010, Fiona quit her first corporate job out of university, just six weeks after she started, and set about trying to become an entrepreneur. However, it wasn't until after two failed businesses that she discovered the power of adventure and her entrepreneurial groove. After a growing number of adventures, in spring 2017 she upped the ante and walked the length of Great Britain, covering 993 miles in 57 days. This was followed in September by cycling almost 1200 miles, solo and unsupported, from Lands End to John O'Groats. 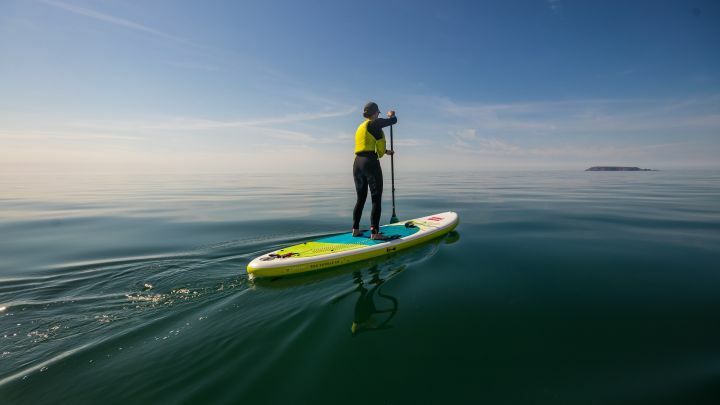 Her latest adventure, to SUP (stand-up paddle board) the length of Britain, means that she is now the first woman to complete a length of Britain triathlon, and the first woman to SUP across the Irish Sea. Through her own experience Fiona has found the huge potential that adventure has for unlocking something within us. For her putting one step in front of the other day after day, not knowing what the path will look like only that you have to move forward, has significant parallels with start-ups and can help build momentum and resilience while carving out your own path.